The Paperbag opened its doors on January 12, 1982. Liz Richmond has been a part of The Paperbag since July 1984. 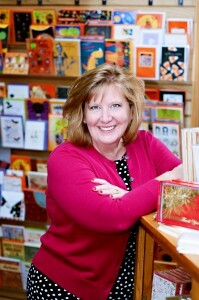 Liz went to Cedar Crest College part-time from 1990 to 1996 while working full-time at the store. She purchased the store in May 1997. The Paperbag prides itself in being the friendliest and most knowledgeable shop in town. You can always find friends visiting each other in a wonderfully fun and friendly atmosphere! They are proud to offer you a unique shopping experience – one that you will enjoy time and time again. In today’s world of impersonal digital greeting cards and email invitations, show your personal style with a custom printed invitation from The Paperbag. Their unique and custom invitations and stationery are available in a wide array of designs and can be customized to suit your personality and special event. If you’re not sure exactly what your looking for, or just a little overwhelmed with all the choices available contact us with any questions you might have and let us help you design your perfect invitation.